KEY FEATURES: Large, 20mm TL. THORAX dorsal shield black with two long and wide longitudinal yellow stripes, expanded anteriorly, and yellow patches laterally; anteo-lateral plates yellow rimmed with dark centres; posterior plate orange-brown with posterior yellow bar; WAIST mainly yellow, with black lines; ABDOMEN anterior yellow, 2nd seg red yellow with fine black band, remainder yellow with black bands. WINGS yellow. LEGS yellow-brown (male - inner seg. with black). 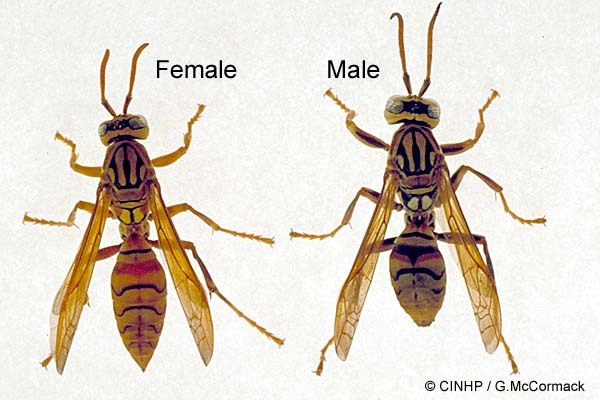 SIMILAR SPECIES: Dark-waist Paper-Hornet (Polistes jadwigae) has overall black waist (vs. mainly yellow); thorax-shield black with two uniformly-narrow parallel lines (vs two anteriorly expanded wide parallel lines); wings smoky-brown (vs yellow). 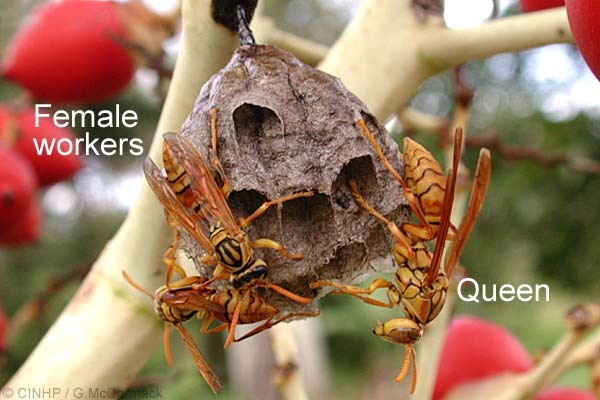 GENERAL NOTE: Nest of chewed wood fibre attached by a narrow stalk under leaves and branches, or building overhands. Special Reference: Kuhlmann, M. (2006) Fauna and Biogeography of the Bees and Wasps of the Cook Islands (Hymenoptera Aculeata), J. Hym. Res. 15(1):26-37.